This navy modern fit designer velvet blazer tuxedo by Statement is going to have everyone looking at you with envy. 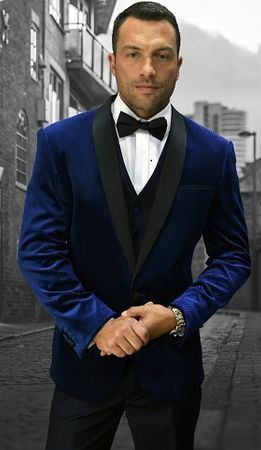 You can wear this designer style tuxedo to a special event and know that you are looking sharp designer style through and through. The velvet jacket on this tuxedo is modern fit designer style with side vents and comes with a black vest and flat front black pants made of poly rayon. Let Statement show you how to wear a tuxedo on the red carpet.